Yep, it’s that time again. Time for another pedal give away at EffectsBay.com! This time I have a brand new T-Rex Tonebug Fuzz to give away! 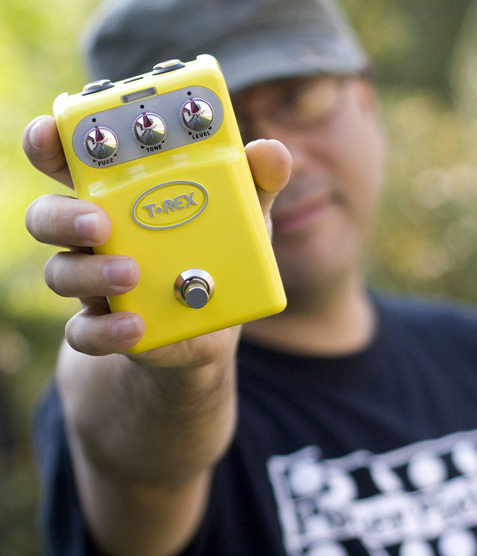 This is another great pedal from T-Rex’s Tonebug series. The T-Rex Tonebug Fuzz normally sells for $99.00 (MSRP: $125), so this is a great pick-up for free. Part of the acclaimed ToneBug Series, the T-Rex ToneBug Fuzz is a fuzz box done right, with exactly the controls you want and no unnecessary complications. You get a Fuzz control, a Level control, and then a great Tone control that lets you fine-tune the timbre of your fuzz to your exact taste. And after all, YOUR TASTE is what T-Rex pedals are all about! Of all the effects that can really make an electric guitar solo really stand out, fuzz is clearly the king. Insanely dirty, but also soft and creamy, fuzz differs from distortion by being far more extreme – boosting the guitar’s signal until it clips so much, it turns from a sine wave into a square wave. However you choose to describe it, fuzz can utterly transform the sound of your guitar and any song you use it on. And right from Dave Davies’ proto-grunge on “You Really Got Me” and Keith Richards’ hellacious dirt on “(I Can’t Get No) Satisfaction”, fuzz has helped shape the sonic world of rock ‘n’ roll. Fuzz is part of the T-Rex Tonebug series, a growing line of pedals that combines the classic T-Rex tone found in our high-end pedals with intuitive, uncomplicated controls – all at a price that any guitarist can afford. I’m going to select one random entry on September 26th. I will email that random entry asking for the answer to the question listed below. They will have 24 hours to respond with the answer. If the 24 hours passes, I will select a new random entry and repeat the process until I receive confirmation from the winner. This is open to everyone. Yes, that means international! Also, one entry per person. Please read that last sentence again… “one” “entry” “per” “person”. And when I say ‘everyone’, I mean anyone older than 18 (sorry minors). The submission form will be open until September 26th (Monday) 12PM MST. On top of that, I’m going to sweeten the deal. If you ‘LIKE’ EffectsBay on Facebook and you’re selected as the winner, I’ll throw in a extra prize – PRIZE 1 (x3) OR PRIZE 2 OR PRIZE 3 (x3). If you’re the winner (and like EffectsBay), you get to pick which one of the bonus prizes. So, it’s pretty much a no-brainer to like Effectsbay on Facebook! T-Rex Tonebug Booster Give Away Caroline Guitar Company Wave Cannon Give Away! VFE Fiery Red Horse Fuzz Give Away! Reminder: VFE Fiery Red Horse Fuzz Give Away! Loud Button WTF Give Away! right now it’s Phil X. what a cool guy. oh, and yeah, he plays like his hands are on fire. Stone Temple Pilots, great musicians and material. John Paul Jones and Dave Grohl is amazing.